Our mission is to make Financial Services faster. Whether that's via our high-performance software, moving data around the industry at the speed of light, or by fine-tuning your operations based on our detailed industry models and technology expertise. Our industry models have shaped dozen of the industry's most ambitious transformation programmes and we are continually exploring innovate new ways to make the industry faster. Synechron is a leading Digital IT Consulting firm and is working to Accelerate Digital initiatives for banks, asset managers, and insurance companies around the world. We achieve this by providing our clients with innovative solutions that solve their most complex business challenges and combining Synechron’s unique, end-to-end Digital, Business Consulting, and Technology services. Based in New York, the company has 18 offices around the globe, with over 8,000 employees producing over $500+M in annual revenue. For more information on the Company please visit the website or our LinkedIn community. Since 1992, IMAS Corporate Finance is an independent corporate advisory firm specialising in advising on mergers, acquisitions and capital raising across the financial services industry with a core focus on Insurance and more recently FinTech. Based on a long track record in the insurance sector, IMAS has worked with a wide range of businesses, from commercial brokers to specialist insurers and claims management companies to underwriting agents and managing general agents. Our approach is to work closely with our clients, helping them to prepare, market and execute transactions, providing bespoke advice and managing discreet processes through to completion. Capital Law is a thriving full service commercial practice with a particular focus on working with innovative technology businesses, at all stages of their journey. We support various InsurTech clients with all their legal and regulatory needs, as well as supporting them commercially with introductions into the insurance and funding markets. Locke Lord (UK) LLP is the London office of a major international law firm. The tech sector is one of our key areas of focus; we act for start-ups as well as mature businesses in areas including financial services, e-payments and e-money, data protection, block-chain, ICT, software and AI and data centres. We have a technology group within our office dealing with all of these areas as well as lawyers specialising in investment, M&A, asset finance, employment law, regulation, litigation, re-financing and (in)solvency, whether for creditors or debtors. Our colleagues in the U.S. also advise on these and many other areas relevant to Insuretech enterprises. GovGrant is here to make sure that innovation is recognised and receives the full range of available tax incentives. We work with companies across a range of industries but have specific expertise in the financial services, insurance and technology sectors. Our technical specialists make working with GovGrant unique. They will come and walk the floors with you and give you the benefit of their business acumen, technical expertise and commercial experience. GovGrant has a 100% success record for R&D tax relief and on average we double existing claims. BMC Recruitment Group is the trusted recruitment partner to leading businesses in Insurtech with national and international reach. Made up of a team of highly experienced recruitment professionals, BMC works closely with clients and candidates to connect talent across a wide rage of disciplines. Polaris is an insurer and broker owned body that's dedicated to setting the standard for the UK general insurance industry. We develop e-trading Standards that are used market-wide - by insurers, MGA's, brokers and software houses. It is with great pleasure we would now like to invite businesses looking to partner with Insurtech UK to submit their interest by emailing the Secretariat, Political Intelligence. 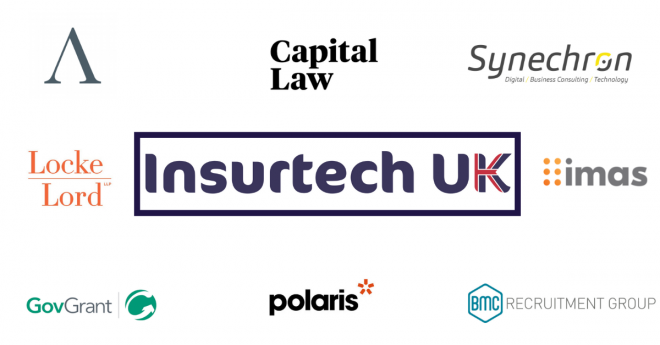 You can also download the partnership packs, via the link below, which outline the benefits of partnering with Insurtech UK, along with the opportunities to engage and contribute to our work.